Family and friends come first for these two nature-lovers. They rented lodges in Deep Creek, Maryland (a mid point for Christine, Jon and their families/friends) and stayed together for the wedding weekend. It was a great way for everyone to get to know each other and bond! While Jon first noticed Christine’s beauty, he soon found out how smart, funny, hardworking & driven she is. She always makes him laugh or brings a smile to his face, yet is also able to challenge him to step out of his comfort zone and achieve his goals. Christine is Jon’s confidant, partner & best friend. Her strengths are his weaknesses and vice versa. She is his true counter part. I love this shadowy portrait of Christine! I photographed several images of her, but this one is my favorite as it has such a sense of strength and mystery to it. Christine, you are gorgeous! Christine and Jon came to me looking for a wedding photographer that offered variety as their photography styles were quite different and they wanted to have a good mix of each style throughout their wedding day coverage. While Jon has a strong appreciation for technical creativity in photography, Christine was looking for something much more soft and romantic. I assured them that I could deliver both and here you will get to see both photography styles within this blog entry :). 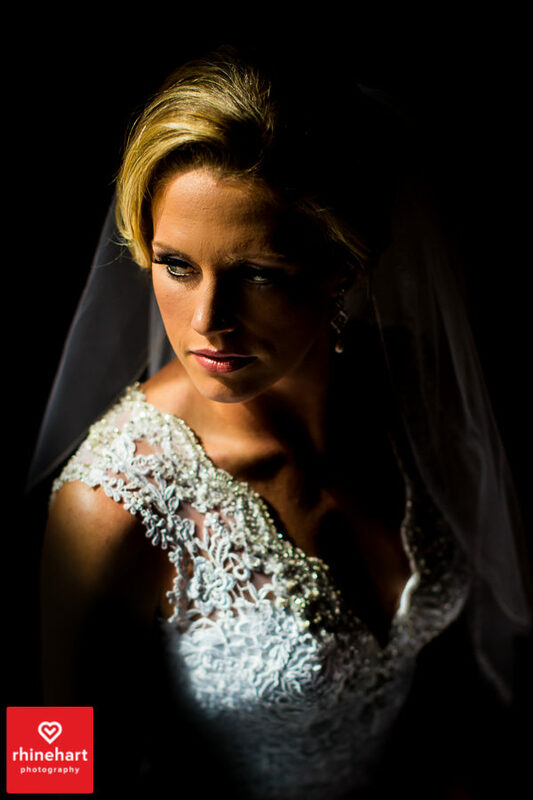 Christine was looking for someone who could photograph the wedding from a “natural light” perspective– someone that had a soft, romantic style, an eye for detail and the ability to take natural, beautiful portraits. You’ll see that style in portraits of her with her bridesmaids, the bouquets, etc. below. What a stunning group of women! I love the vintage inspired floor-length gowns in satin, lace and chiffon. The orchids and pine trees pulled in the deep, rich greens and really made them pop (above)! Take a closer look at this bouquets, so beautiful! Christine’s flower girl is also her goddaughter. The little girl mentioned feeling like a princess and wanting to wear a crown, so Christine chose this incredibly sweet crown of baby’s breath for her to wear. The majority of Jon’s men were police officers that he met in the police academy, others were family and long-time friends. He said the three police officers were the first to meet Christine and were instantly accepting of her which meant so much to Jon. Jon is a pretty big photo buff and was looking for more creativity and technical photography skills. He wanted someone that would manually expose to creatively capture unusual aspects like movement and shadow– someone who had a variety of lenses and tools at their disposal that they could put to use in unique ways, he specifically mentioned my use of off-camera flash (which you will see at the end of the wedding) and my fish-eye lens (which you can see below). Here is a creative shot for you, Jon! It is creative in perspective and lens choice. I really like the colorful variety which Jon attributed to varying taste in beers and mixed drinks, yes there is a rum and coke in the mix, haaaa. Christine said she knew Jon was the one because he made her feel so comfortable in her own skin. She said they have their disagreements but share the same major values in life. She can tell him anything and he is her rock. He is also a true partner and team player– they both do their fair share of cooking, cleaning, laundry. She said he is a great man inside and out and makes her feel incredibly loved and appreciated daily. Jon said he was full of emotion– nervous, happy & excited all at once and was just trying his best to contain himself. During the day his mind had been on many of the wedding details, but when he saw Christine, all of that went away. He could not get over how beautiful she looked and the person that she is. He wasn’t the only one showing emotion, here Christine’s cousin, Megan is watching the moment as a tear rolls down her cheek…. Tears were soon replaced with laughter as Christine said aloud, “Jon’s crying!” It caught everyone by surprise, and made them laugh out loud! When I told you I wanted us to write our own vows I know that you weren’t very thrilled, and trust me I’m sure I’m regretting it as I’m reading these, but I wanted you to hear my voice and know that they are from my heart. I can stand up here and make promises in some eloquent way but let’s be honest there are things I can’t promise. Like I can’t promise that I won’t get “hangry” and lose my patience with you on a daily basis. I can’t promise not to bring home my stresses or not get irritated when you want to buy all the generic condiments or when you rewash my dishes, and I can’t promise that our life will be rainbows and butterflies. I can’t promise to be a perfect wife or mother because I’m far from perfect. And I really can’t promise that loving me will always be easy. But what I can promise is to say I’m sorry (once I eat), admit when I’m wrong, accept your apologies and just roll my eyes, smile and kiss you when you irritate me because at the end of the day I accept you for all of your perfections and imperfections. I can promise that I will stand next to you and support you through all of life’s ups and downs. I promise that I will love, cherish and respect you every single day of our lives. I promise to live perfectly imperfect with you in this chaos called life. It’s not going to be easy; it’s going to be really hard. But I promise to work on this and be in this journey with you yesterday, today and forever. By now you may have figured out that I am far from perfect and I don’t always do or say the right things to make you happy. I may not be the most sensitive person at times, and I’m not going to try to tell you that I’ll ever be as sensitive as you’d like, but I will promise you this; I will always be there for you. Whether in happiness or in sadness, I will be by your side and I will try to understand your needs. We are two different people with different thoughts, ideas, and ways of doing things. We may not always see eye to eye, but I will always respect your differences. I promise to acknowledge and accept your faults and strengths, as you do mine. Regardless of how much we may differ, I will always find balance in you, as you are my true counterpart. I will be forgiving and seek compromise; striving to work with you, not against you. I will communicate openly and honestly as we live and grow together. I will always be your encouragement; supporting all your hopes and dreams. I will honor you, respect you, and cherish you. I will always be honest with you, loyal and faithful. whatever comes our way, for all the days of my life. I like how they are surrounded by nature and their family and friends in the image above and I am totally in love with the image below. It totally captures all of their joy, enthusiasm & raw emotion as well as the recessional flow in real time and the lovely arch that Christine’s brother created for their wedding day. Their bridal party could not be more excited! I have a color option of this photo as well, but like the high-contrast black and white version because it focuses your attention on the emotion and excitement of this crowd! Christine and Jon savored their time alone as a couple, walking together. The day (and weekend) was jam packed with social interaction. It was nice to just take some time and let it all sink in. One of the other creative photography techniques that drew Jon to my work and that he actually mentioned by name was “slow-shutter speed” so I knew I wanted to incorporate it somehow into the wedding photos. Children were an important focus for Christine and Jon and they invited several families with young children to participate in their ceremony and reception. Christine used champagne flutes as her place cards, but wanted something nice for the children, too. She decided to use champagne flutes but fill them with milk instead and top each with a chocolate chip cookie. It was such a unique and sweet idea! Kids and family played an important role at the reception. Christine said she felt like the children kept the adults out on the dance floor all night and kept them laughing. You can see why :). This little boy in particular had everyone smiling, and for good reason! It is Christine’s little cousin who has a rare brain tumor. His father held him on his shoulders and from up there it was clear he felt like he was king of the world! He was all smiles during their reception and getting high-fives all night long. A real-life “movie moment” for Christine was having the big tented reception that she had always dreamed of. Here she and Jon take a moment alone in front of the luminaries, tent and vibrant night sky, yes that is the moon peeking out from behind the clouds! At the end of the night, Christine and Jon had a feeling of peace and accomplishment. They were a true team. Christine had the wedding day’s “big picture” in mind and Jon executed many of the details that made it possible. They were also extremely grateful to be surrounded by such incredible family and friends that bonded over the wedding weekend. Their families and friends had united! Christine & Jon, thank you so much for inviting me to be a part of your wedding day and record these memories of you, your family and friends for many years to come. It was such a pleasure to work with you and I wish you (and Remy, too) all the very best! If you can’t get enough of these two, you might want to check out their engagement blog here. I am having a wedding at the Historic Acres of Hershey on 9/8/19. I am having difficulty finding a company that captures natural and authentic moments as opposed to staged poses. Your pictures are truly beautiful. I am interested in prices for photography, preferably two photographers. Can you please send pricing?